I have always been into a digging stuff and walking around old ancient sites is just one of my favorite activities to do. Also I'm into a history. 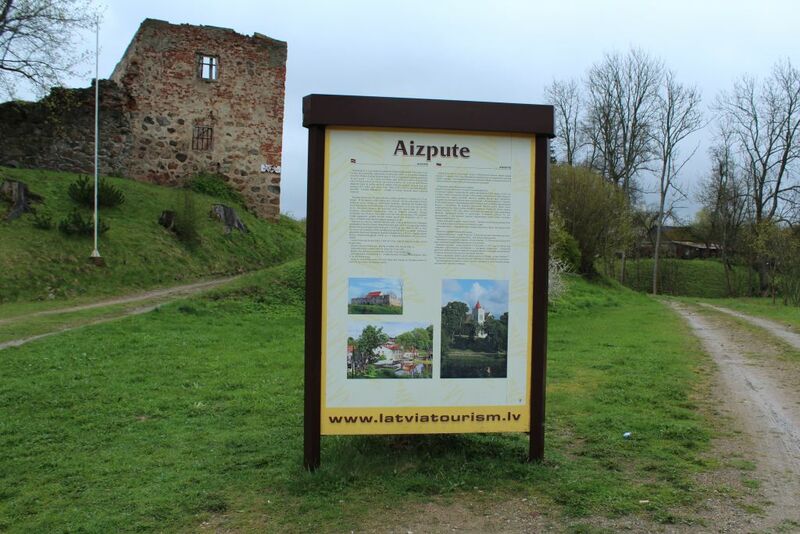 So it's no surprise I visited a site called Livonian Order Castle Ruins at Aizpute. Seems that some renovation/conservation works have been held here - I can see that roof has been changed here and some new bricks have been added. Read my photo story of Aizpute Saint John's church. At the beginning of the 19th century, when the castle was only partly inhabited, the manor owners lived in the new landlord’s house. 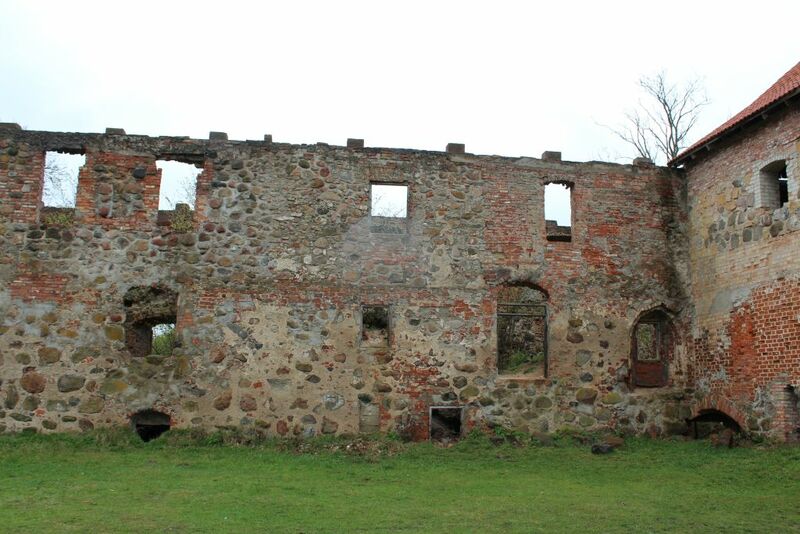 It was built in the second half of the 18th century, not far from the castle, on the other side of the mill pond. Next to the pond there was also a mill, a distillery, and adjacent to the landlord’s house – farm buildings. 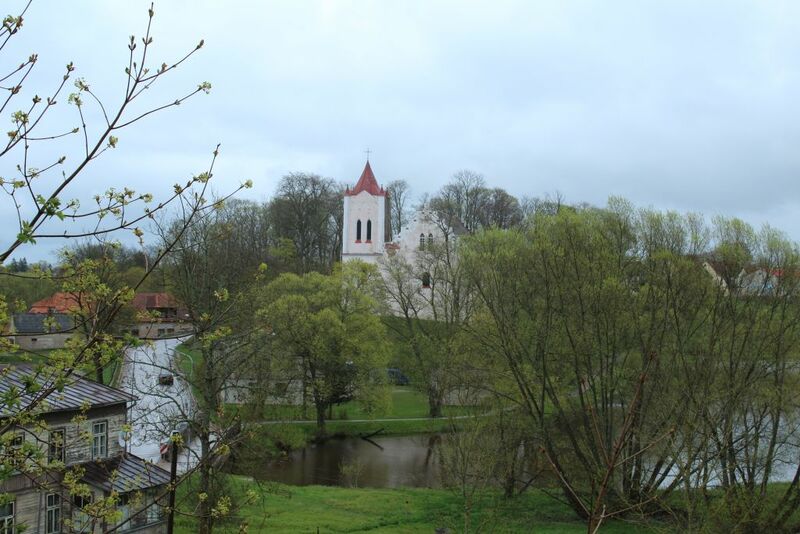 Aizpute’s Lutheran congregation’s church and the former castle-manor building complex form a unified town planning ensemble with a watermill, pond and dam on the Tebra River. The Order castle of a regular plan castellum type, with a corner tower and wooden buildings in the courtyard, was built in the 13th-14th centuries. 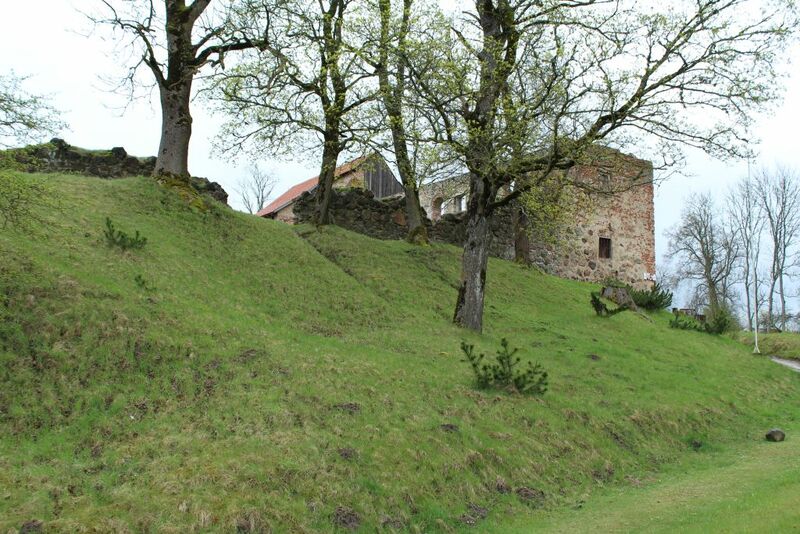 In the 15th century, an eastern wing was built on the outside next to the castle wall. 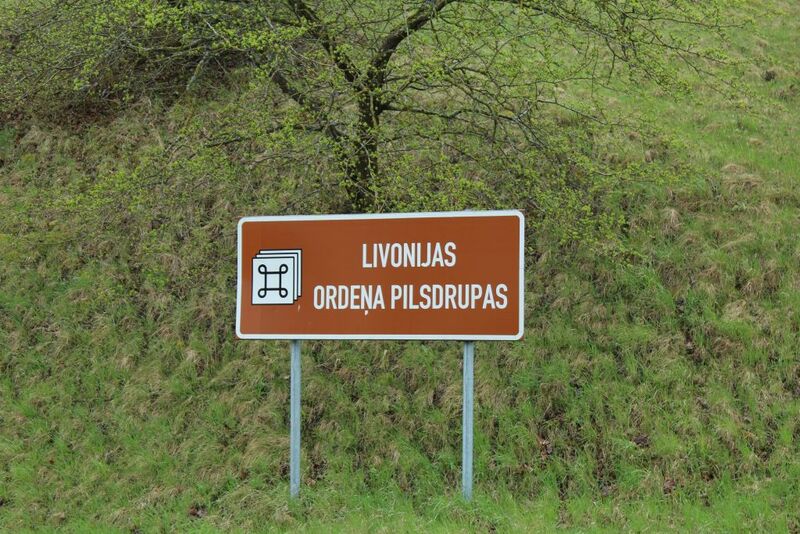 After the Livonian War the castle was no longer used and written sources reveal that in 1555 it was mentioned as a grain store. At the end of the 16th century – early 17th century, the castle was restored. Plastering with ornate and rich decorative finish in a sgraffito technique remains in the courtyard above the gates since that time. 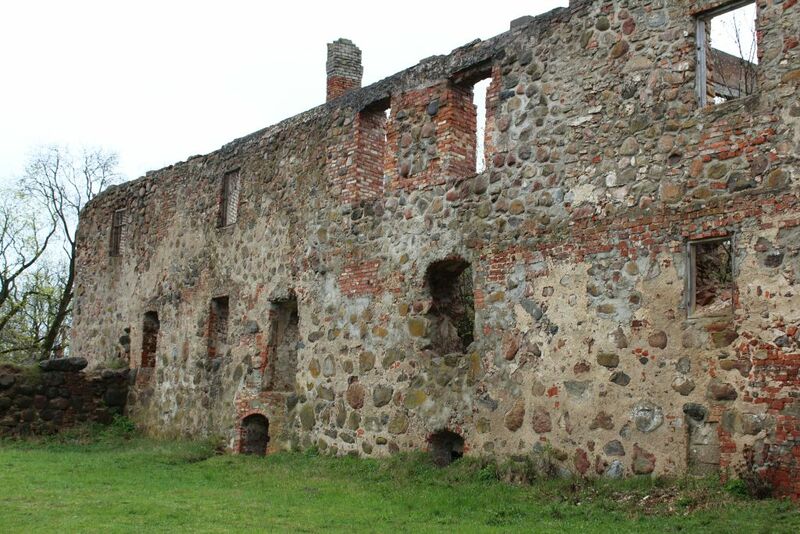 In the mid 17th century, during the Polish-Swedish War, the castle was heavily damaged, then restored in 1665, and Duke Jacob’s garrison and artillery team was stationed there. After the death of Duke Jacob, in 1682 the castle came into the possession of Mihael Friedrich Nolde. 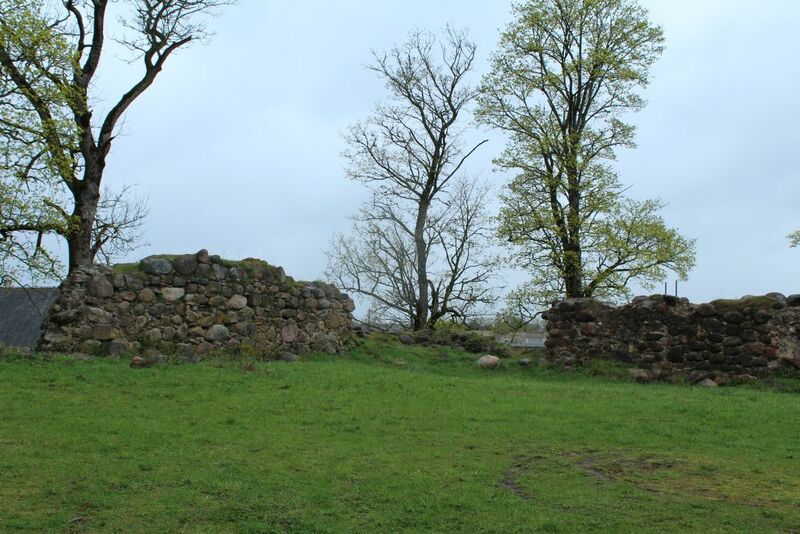 The castle lost the character of a fortified construction, was reconstructed, and a residential block was added inside the protective walls. Even now the castle is gradually losing its importance as a residential building and is only partly inhabited. Over the time, the courtyard level has increased by 1.5 m. At the beginning of the 19th century the current gently sloping brick vaults and the new dividing walls were built for the castle’s eastern wing and the south eastern tower. 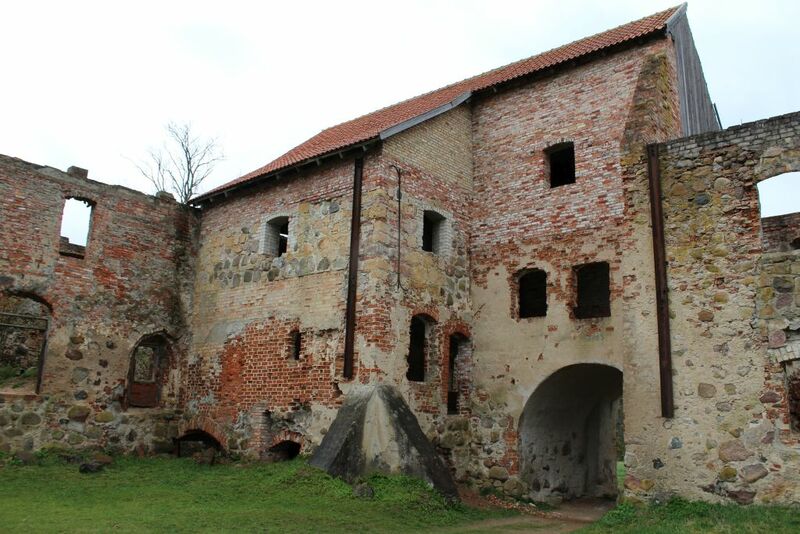 At the beginning of the 20th century the castle was almost unusable, and currently a part of it is a bad condition. 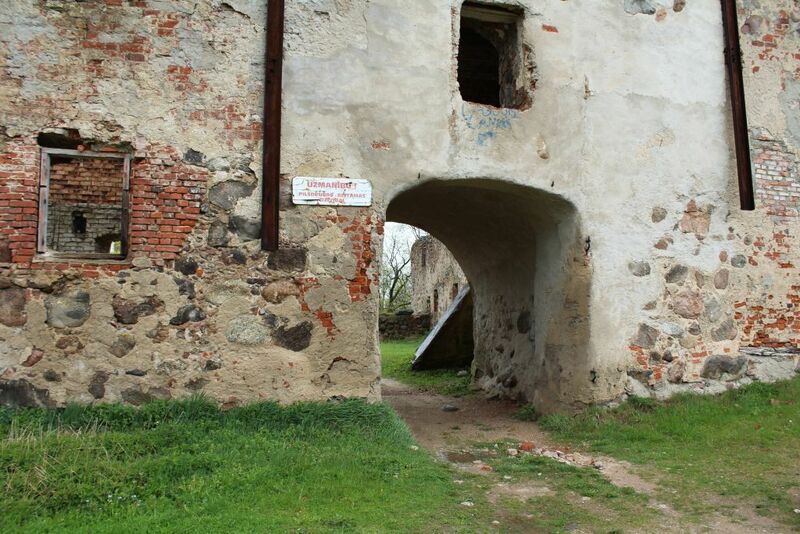 The castle walls and ceilings are in a terrible condition: the roof of the building is partly gone, all of the first floor ceiling and load bearing partition walls have collapsed, mantel chimneys have been destroyed, part of the cellar vaulted ceiling has collapsed, and the rest is in a bad condition. Reconstruction work was commenced in 1990, but was suspended. There have been a number of inspections undertaken. In 1997, a plan was developed to anchor the walls and for the construction of the roof which was partly done in the D wing section. In 1999, there was a limited castle wall conservation performed for a small part of the castle section on the right wing – a tiled roof was erected.